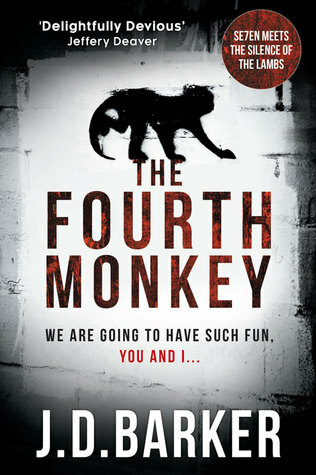 The Fourth Monkey is enormous fun, if you can call a tale of a serial killer ‘fun’. Even if I did spot the twist some twenty pages in and worked out how it would pan out way before the end (one of the perils of reading so many books, I suspect! ), and I *still* really enjoyed it! I loved the detectives’ banter as they raced to solve the clues left by 4MK – they made a fantastic team and I’d love to see them in more investigations. I also really liked the way the main story is interspersed with the diary extracts of 4MK as a young boy – they really gave the story added depth and intrigue – you’re torn between wanting to find out more about the diary, but also more about the investigation in the present day. You can find JD Barker on twitter @jdbarker. The Fourth Monkey is published by HQ and is out now in hardback and ebook. Thanks to Liz @Cvr_2_Cvr from Cover to Cover for hosting the competition which resulted in me getting a copy of the book!